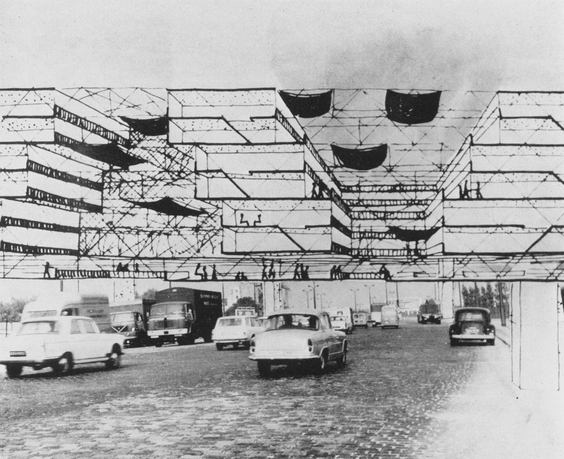 Yona Friedman, collage on a postcard visualizing a Spatial City over Paris, 1960, Paris. Collection of Centre Georges Pompidou. Courtesy of Adagp. In the late 1950s, Yona Friedman catalyzed a “crisis of professionalism” in architecture by demanding that those who use spaces be allowed to design them. 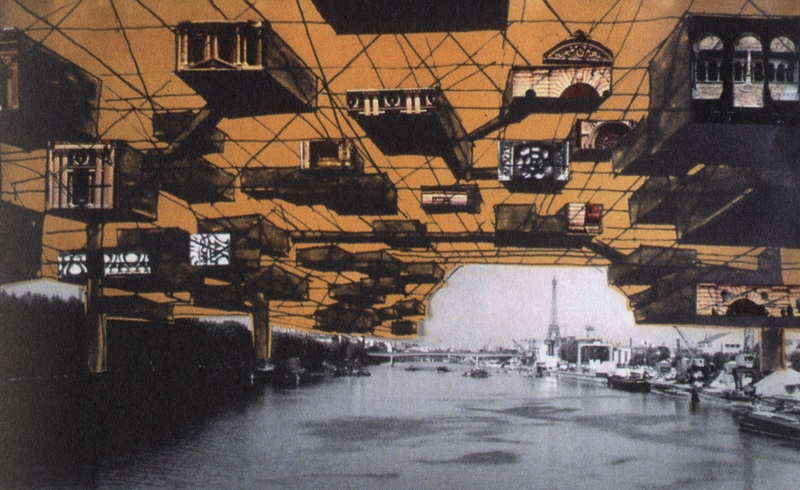 Inspiring contemporary interest in user participation and galvanizing the birth of megastructuralism, he envisioned “un-planned” habitats supported by adaptable space-frames and suspended above extant cities. Friedman, who has built little, is today known for striking collages visualizing such “Spatial Cities.” Yet, in seeming contradiction, he describes the act of ceding aesthetic control to users as irreconcilable with the inherently prescriptive nature of architectural imagery. Friedman's pictures and theories constitute parallel and conflicting practices. Tensions between ideals of participation and traditions of architectural representation motivated his invention of pictographic languages and drove his pioneering experiments with new media and emergent computer-aided design in the 1960s and '70s. The art world's adoption of Friedman’s work in the 1990s is a testament to the diverging legacies of his pictorial and his theoretical practices. Rectifying a lack of scholarly attention at odds with Friedman's immense influence, this dissertation theorizes the changing status of the architectural image in the postwar era. Jesse Lockard is a PhD candidate in the Department of Art History at the University of Chicago, specializing in postwar architecture and urbanism. She also works on the historiography of art history, researching the place of architectural theory in the development of early formalism. Her article on the politics of aniconism and the historiography of Jewish art from classical antiquity, coauthored with Jaś Elsner, will appear in Empires of Faith: Method and Comparison in the Art and Religion of Late Antiquity (2016) and her article on Aloïs Riegl's visual rhetoric was solicited by the History of Photography journal. Lockard is the recipient of a 2015 Council on Library and Information Resources (CLIR) Mellon Fellowship for Dissertation Research in Original Sources and the 2014 Schiff Foundation Fellowship for Critical Architectural Writing. After graduating from Sarah Lawrence College in 2008, she was awarded a T.J. Watson Fellowship for research.